Looking south at NE 41st and Fremont. Top, September 1929. Courtesy of City of Portland Archives, A2001-062.46. Bottom, same view in March 2019. This building was designed and built by Shipley & Snashall, a partnership between two carpenters operating from 1922 until 1931. 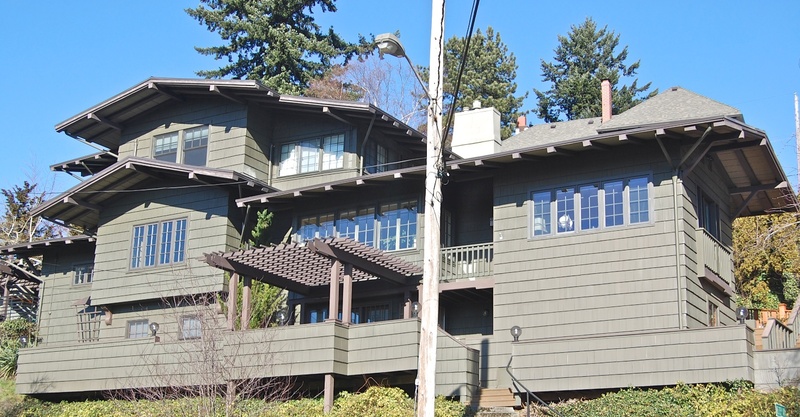 George Shipley and Valentine G. Snashall specialized in design and construction of eastside retail spaces, though they built several residences as well. 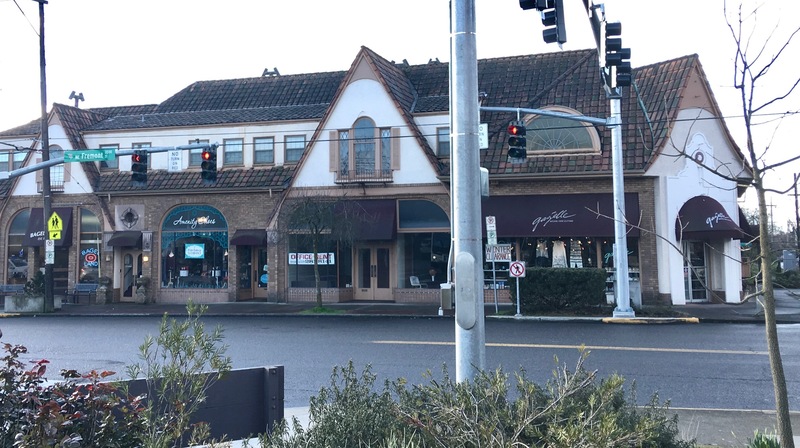 Their most well-known work is the building that in 2019 houses Peet’s Coffee and several other shops at the northwest corner of NE 15th and Broadway—you can see clear family resemblances—which was added to the National Register of Historic Places in 1992. Shipley & Snashall completed the Beaumont building—which in our opinion is also likely register-worthy—in September 1928. 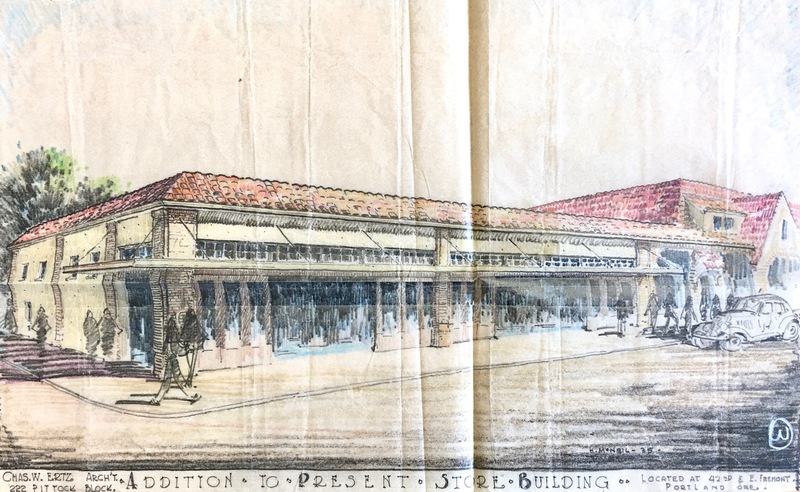 Our other recent archive discovery relates to the Beaumont Market building due east of the Shipley & Snashall building and which most people assume is all part of the same structure. Amaze your friends and neighbors with local trivia by explaining how the market building was actually built seven years after the signature buildings at the corner. Here’s the related correspondence: a “do pass” recommendation from the Commissioner of Public Works and lead building official giving City Council a thumbs up to proceed, which they did unanimously. Like many of us, you may have thought all those storefronts at NE 42nd and Fremont were one single building. Now we know. Tip of the hat to the architect! 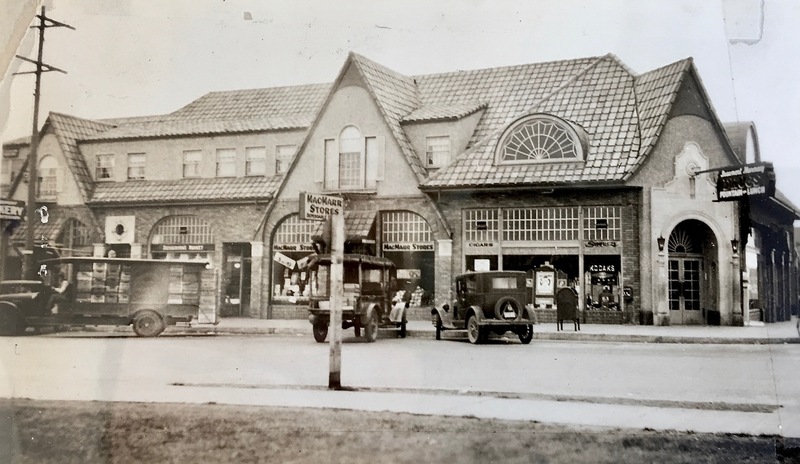 If you haven’t already seen them, a ways back we shared a half-dozen or so photos of Beaumont from the 1920s along with a deep dive into the retail history of the intersection. Be sure to check them out here, here and here. And our short biography of architect Charles Ertz. The story of the Oregon Home Builders is one of a big vision that ended in bankruptcy and likely even unprosecuted fraud. But it’s also a story of productivity and lasting accomplishment, with works of careful design and craftsmanship that have survived a century. Founded in 1912 by a group of established Portland and Willamette Valley businessmen, OHB’s primary mission appears to have been to make a lot of money, to use as much of other people’s money as possible to do that, and to benefit from skyrocketing growth in real estate and in-migration to the Portland area in the years following the 1905 Lewis and Clark World’s Fair, which had put Portland on the map. Consider the primary organizers of the company: the chief attorney and the general manager of Portland Railway Light and Power, which was building the essential and widespread transportation system that enabled Portland’s eastside expansion; a leader of the Portland Retail Merchant’s Association; the president of a major lumber company; several bankers and accountants; one of the leading automobile dealers of the day; a charismatic and successful 24-year-old real estate broker from a prominent Portland family named Oliver King Jeffery (who also happened to be related to the bankers and accountants). Add in a few other friends and relatives: a successful farmer from the Newberg area, the former mayor of Newberg, and a captain of heavy industry from back east (also related). From the Photographic Business and Professional Directory, American Publishing Company, 1916. This group incorporated in early 1912 as the Oregon Home Builders with Jeffery as its president and a borrowed corporate strategy from the Los Angeles Investment Company, led by Charles A. Elder, who was known at the time across California as the “King of the Homebuilders.” Elder’s company had become that state’s most prolific builder of homes, arranger of financing and developer of real estate. OHB liked what it saw to the south and structured itself much like Elder’s company, where investors put up the money to start and fuel operations by buying stock that would turn to profit once the company started actually selling homes. Following several trips to L.A. to witness Elder’s success and methods, new president Oliver K. Jeffery returned to Portland fired up and ready to raise capital. 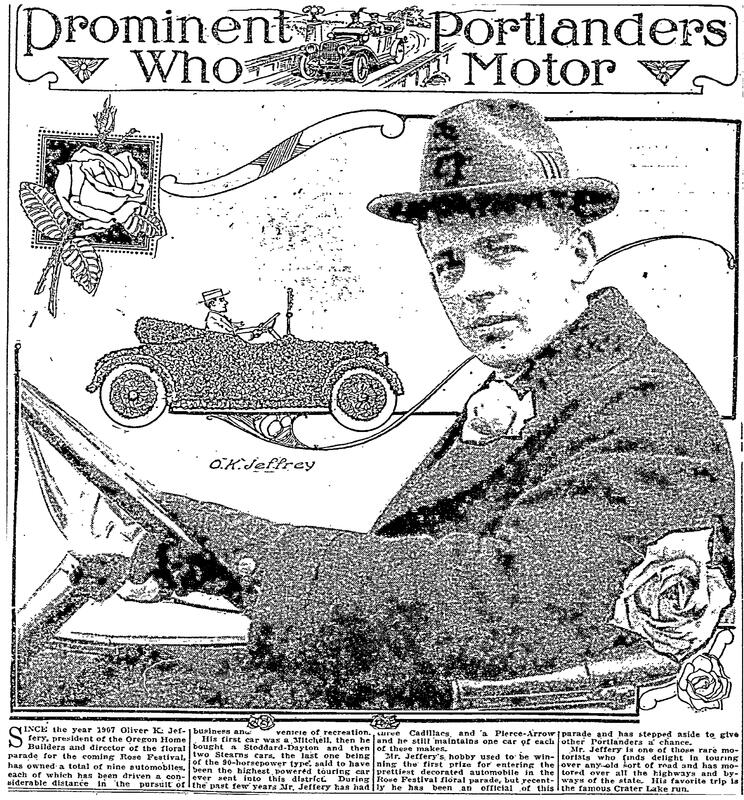 Oliver K. Jeffery was prominent in the Portland social scene as a leading Rosarian, later credited with inventing the Rose Festival Parade, and even at age 24 had helped build the successful commercial and residential real estate firm of Keasey, Humason and Jeffery. His family owned and developed much of the King’s Heights area on Portland’s westside (his mother Nautilla was a daughter of the King family). So when he started talking about real estate, people wanted to listen. 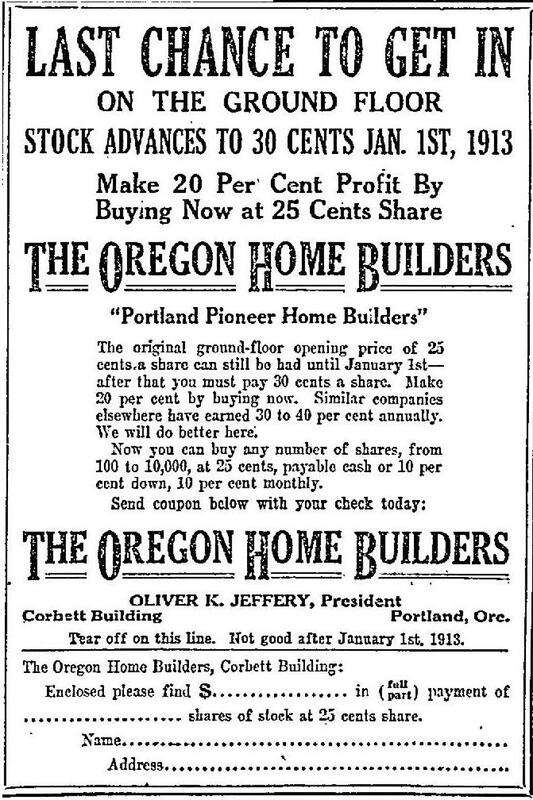 Here’s the grand plan Jeffery spelled out in The Oregonian on February 9, 1913 as a paid advertisement. Note the reference to 1000 % profit, an early signal of the group’s underlying intention. 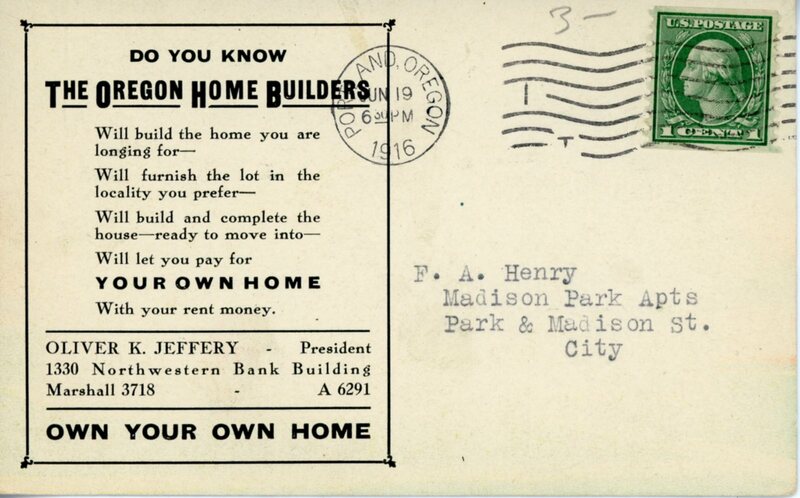 As it tried to create a financial head of steam, OHB’s early advertising push was marked more by pitches for investment and financial return than anything actually related to home ownership or home building, but that would follow once the company had sufficient assets to make the thing go. Here’s a sample of what OHB told readers of The Oregonian and The Daily Oregon Journal on a frequent basis in 1912-1913. Once capitalized, OHB did start buying property in what it termed “first class” subdivisions being platted like Laurelhurst, Alameda Park and Olmsted Park, and it concentrated particularly near streetcar lines. It even bought and sold some home properties at the coast, where Jeffery had been active as a real estate agent before OHB. In the first two years, the company also relocated its offices twice, from the 5th floor of the Corbett Building to the 14th floor of the Yeon Building, and then finally to a prestigious suite of offices on the 13th floor of the Northwest Bank Building (known today as the American Bank Building, 621 SW Morrison). And then in 1913, encouraged by a rising local economy, OHB began building homes. 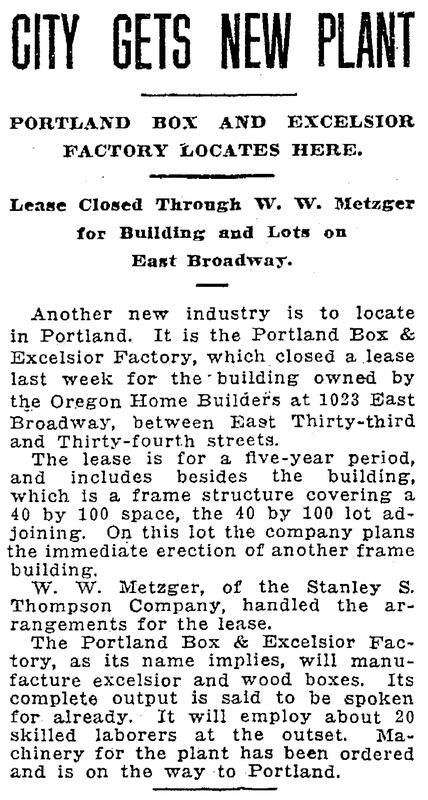 At the bottom of this article is a partial list by year that we’ve gleaned from reading every entry about the company in The Oregonian and the Oregon Journal between 1912-1921, and from a study of building permits we completed in 2010. OHB’s principal architect during the early years was George Asa Eastman whose talent is still visible today in the homes he designed. Eastman was born in Albany, New York on January 16, 1880 and arrived in Portland in 1900. He worked for a time as a salesman, window dresser and furniture designer, marrying Lillian Key Brooks in 1906. City directories from 1911-1916 list him as an architect. During those years Eastman kept a busy practice of his own as architect and homebuilder, but he also worked for OHB. 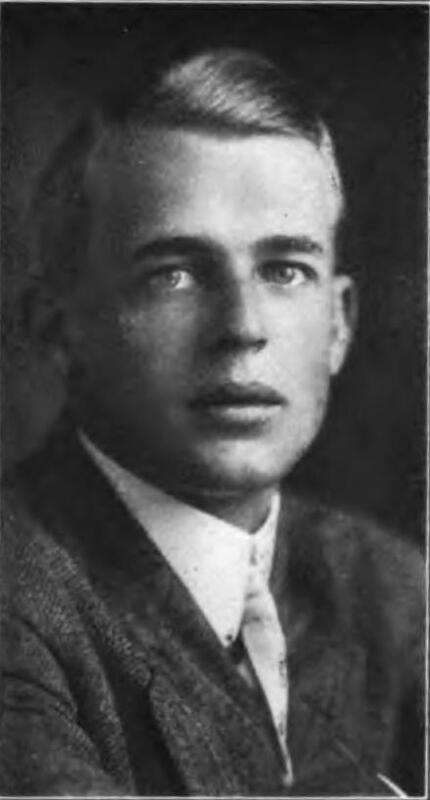 Eastman traveled in social circles with both Jeffery and Edward Zest Ferguson, president of the Alameda Land Company, which developed the Alameda neighborhood. Eastman’s early work is notable for its Craftsman and Prairie School influence. 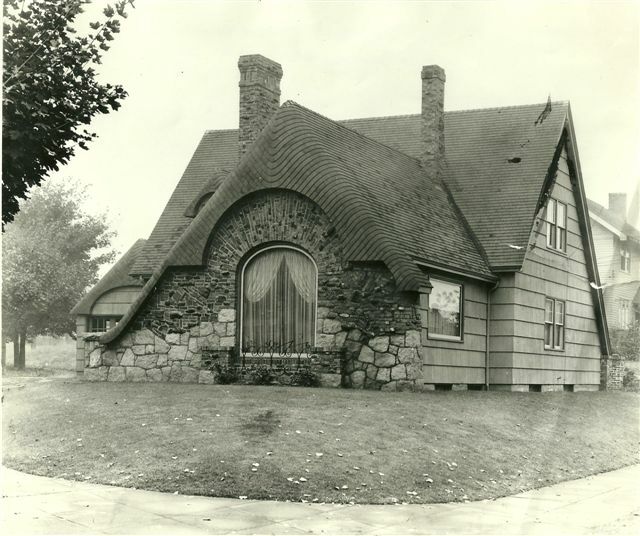 Check out the Zimmerman-Rudeen House at 3425 NE Beakey; the George and Lillian Eastman House at 2826 NE Stuart, which he designed and lived in; 2747 NE 18th; 2442 NE 24th; 2803 NE 24th; 5620 NE Cleveland; 2334 NE 25th, 49 Briarwood Court, Lake Oswego. All of these bear strong family resemblance. Three of his homes in Northeast Portland are on the National Register of Historic Places. He was a talent. George and Lillian Eastman home, 2826 NE Stuart. Designed and built by Eastman in 1912. He and his family lived here from 1913-1915 before moving to Detroit, Michigan where Eastman worked for Associated Builders Co. before his untimely death in 1920 at age 40. Perhaps Eastman saw the writing on the wall here in Portland: he and Lillian and their two children George and Virginia left in 1916 for Detroit, Michigan where the design and building of high-end homes was going strong. Eastman’s architectural career was brief: he died on January 25, 1920 and is buried in Birmingham, Alabama—Lillian’s hometown—where Lillian, George Jr., Virginia, and infant daughter Jane moved following George’s death. After Eastman left Portland, architect Max Meyer took over briefly as lead architect for OHB, before leaving to start his own private practice in 1917, where he advertised himself as “formerly with Oregon Home Builders,” signaling the company’s lingering cachet even after it eventually closed its doors. On the construction side of the business, many of the city building permits taken out by OHB had H. Riley Linville’s name on them, who for a while was chief plumber and partner in the Linville-Myers Plumbing Co. The full list of carpenters, laborers, day workers, superintendents and other OHB employees remains unknown. These building professionals knew what they were doing. 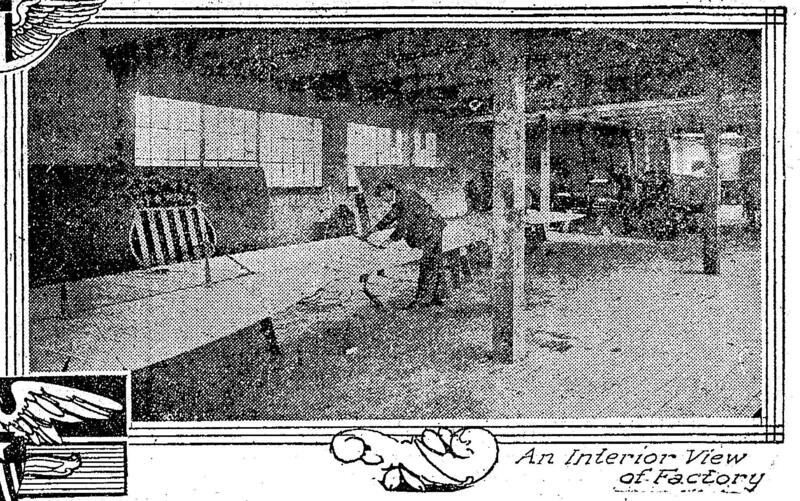 In 1915 they built a conveniently located workshop and warehouse at NE 33rd and Broadway, which in late 1916 was expanded into the building on that corner we know today as the former Gordon’s Fireplace Shop which later figured in another very brief but failed Jeffery vision known as the aircraft factory. Little more than a big shed at first and then later a full three-story building with milling equipment, that corner was a manufacturing hub for built-in cabinets, shelves, window and door casements and furniture that went into OHB homes. And they just kept building houses, often multiples in a block bought by OHB, and for individual clients who had picked a particular home design from their catalog. Some were modest and run of the mill. Others were show houses. From The Oregonian, June 10, 1917. The house above is at 2931 NE Dunckley; below is 3024 NE Bryce. Both built by OHB. 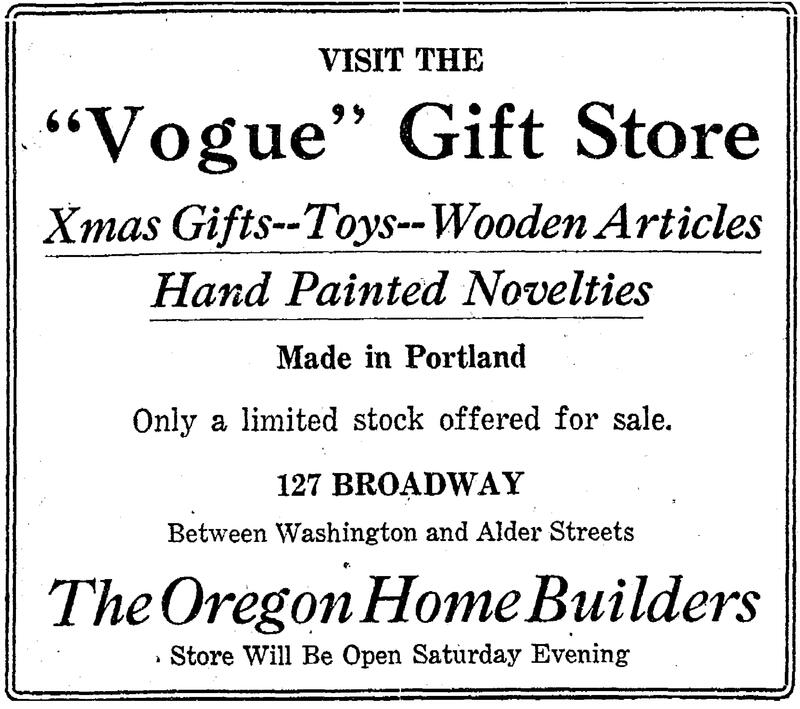 All of Portland was readdressed in 1931. Playing against type, in 1915 OHB launched a rental department and brought in a high-powered rental agent from St. Louis named G. Gilbert Rohrer, who lasted about 12 months before leaving to start his own company. Given Jefferey’s expressed bias for home ownership, Rohrer may have never felt quite at home managing rentals at OHB. But as Portland’s building and buying economy began to slow down, the rental economy stayed strong and the company wanted to keep a hand in the rental business. After all, a percentage of home renters did become home buyers. 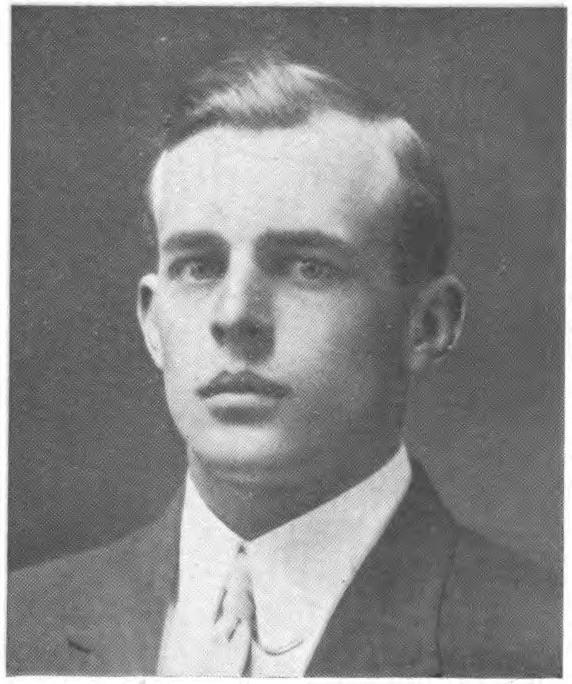 Rohrer was replaced by John A. Gravley. The peak of the company’s short life may have come in 1916 when OHB’s lead architect George Eastman designed and built a custom home for Jeffery and his wife Margaret: the three-story Dutch Colonial Revival that still stands at the corner of NE Bryce and NE Regents. The company had hit its stride: it was capitalized (or seemed to be), had a system for production and track record of well-made homes, and was extremely well networked. The new Jeffery home would be a showpiece of just what OHB could do. And it would be highly visible from the Broadway Streetcar line, a beacon to impress would-be investors and potential home buyers. The Oliver and Margaret Jeffrey House is an intact Dutch Colonial Revival design drafted and built by the Oregon Home Builders for Oliver K. and Margaret M. Jeffrey in 1915-1916. This wood-framed, two- and-one-half-story residence is oriented to the southwest and has an unusual cross-gambrel roof form. It has specially milled 10-inch beveled siding, asphalt shingle roofing with attached copper downspouts and gutters, two external granite chimneys, porticoes supported by massive Tuscan columns on its front and west side facades, and a porte-cochere with Tuscan columns on its rear facade. 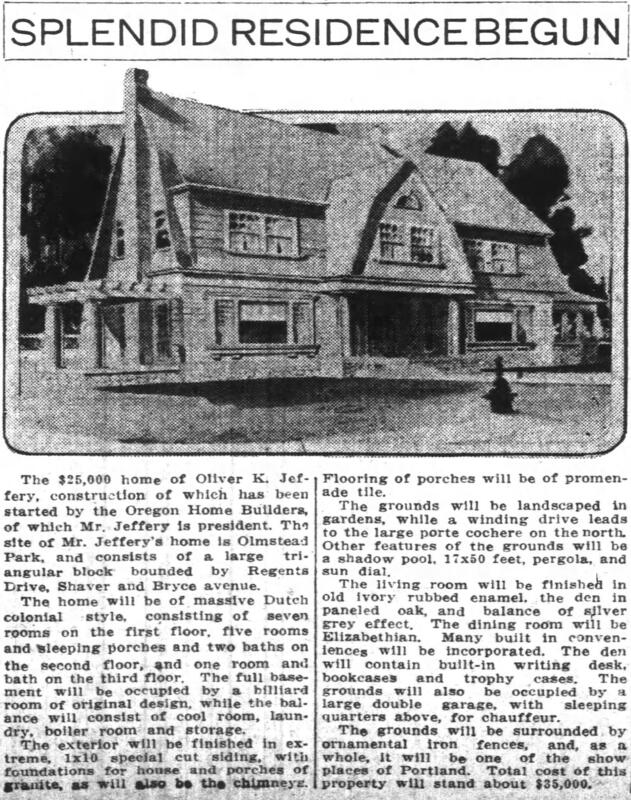 In an interesting Jeffery family note, in 1920, older brother Edward J. Jeffery Jr., a prominent Portland automobile dealer, moved in to a house within line-of-sight at the northwest corner of NE 29th and Bryce. Not long after completing the Jeffery House, OHB built another stately and carefully constructed mega-house, this time for board member Thomas Prince, also visible from the streetcar line. This three-story brick Georgian looms over the Alameda Ridge at the intersection of NE Alameda and NE Regents. It’s also deservedly on the National Register of Historic Places, and also an Eastman design. A few years back we visited the Thomas Prince House and shared photos and insights about its early residents which you can read here. 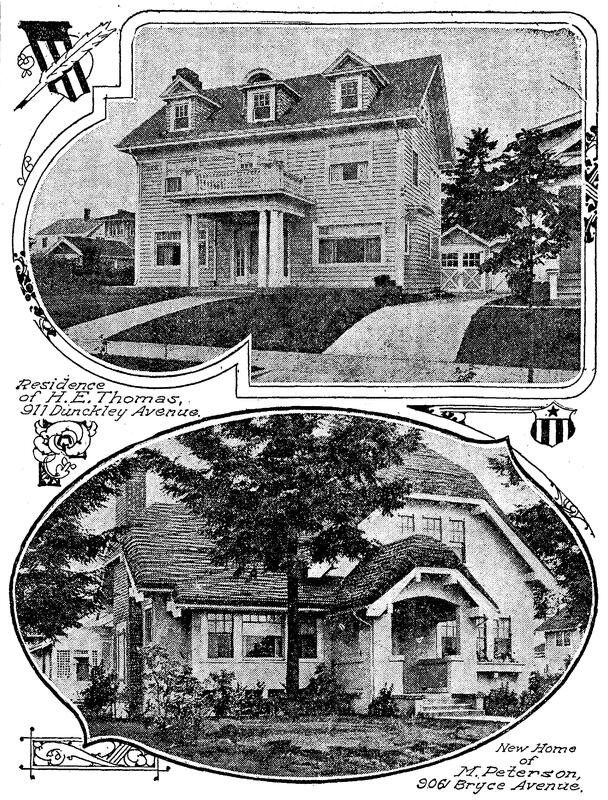 Postcard front and back featuring one of the most popular bungalow designs from the Oregon Home Builders, likely the work of George A. Eastman. Courtesy of Steve Dotterrer and the Architectural Heritage Center, used with permission. Despite the success and notoriety of the two mega houses on the Alameda ridge, Jeffery’s prominence and the company’s visibility in Portland life, by 1917 Portland’s economy and real estate market was beginning to slump and Jeffery’s path had begun to change. In August, the company bought a brand-new Ford (listed in the new car purchase list in the newspaper…yes there was such a thing when cars were a new and uncommon thing). And then people began to leave. Salesmen first and then Alfred R. Johnson the general manager in early October. By then, the only name still associated with OHB was Earl H. Fry who specialized in agricultural land sales. By late October 1917, the company dropped quietly into bankruptcy, taken over by a creditors’ committee. Jeffery’s name no longer appeared on OHB materials. No newspaper even mentioned the bankruptcy until four years later, though ads touting OHB farm properties appeared status quo in the newspapers until late 1917. The creditors’ committee was quietly maneuvering to sell off assets while it could in the months after bankruptcy. So what happened to Oliver K. Jeffery? 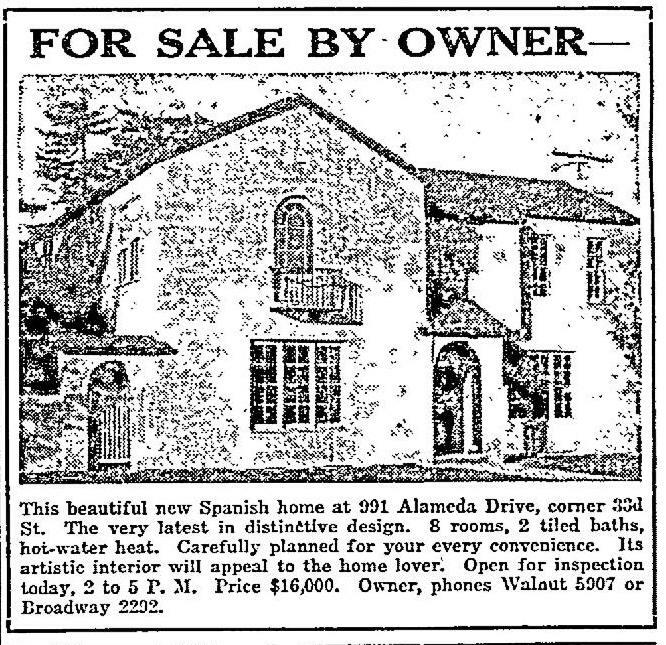 In January 1918, the Jefferys sold the flagship Alameda Park home to the president of Inman-Poulsen Lumber Company. Then in early March 1918, in a spectacular public announcement covered prominently by the newspapers, Jeffery sued his wife for divorce, and her alleged lover for $100,000 for “alienation of affection.” One week later, with no discernable change in circumstances, he withdrew both suits, but not long after, the couple split. In October 1918, Jeffery enrolled as a corporal in the WWI tank corps and went to training, but was never assigned to duty nor sent out of the Portland area. His interest had fully shifted to flying his personal airplanes and thinking about airplane-related business ventures. From The Oregonian, October 28 1917. OHB was in receivership when this was taken. 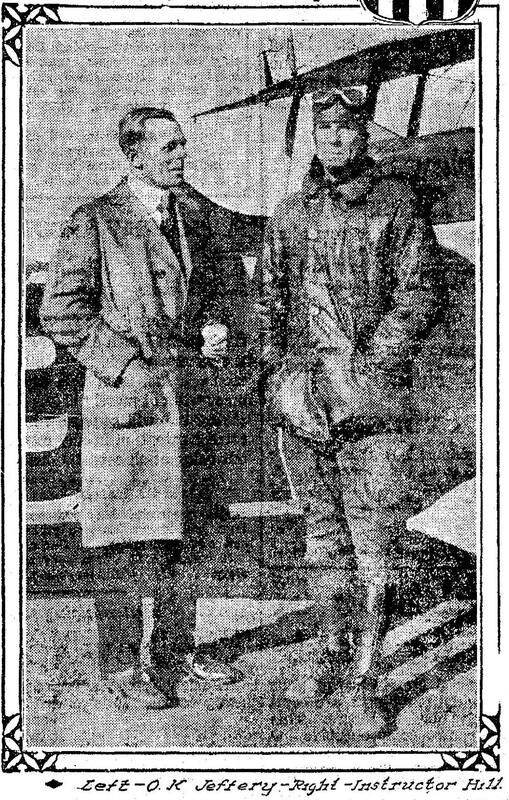 The story that accompanied the photo quoted Jeffery at length about his flying adventures and reported that he was visiting “various flying camps in the east” and was organizing a company to manufacture parts for airplanes. Nothing said about the company that just had crash landed taking investors funds along for the ride. Jeffery eventually found his way back to Portland. In 1924 he was the general manager of a company that existed only on paper called Blue J which attempted to bribe Portland City Commissioner Charles P. Keyser with Blue J company stock in exchange for control of a series of automobile campsites the company hoped to build around the city. Keyser was exonerated. Jeffery and his fellow Blue J board members were publicly admonished by City Council for their carelessness and their intent to influence public decisions. Two years later he entered the mortgage business, opening a company called First Bond and Mortgage, which did not survive the Great Depression. By then—after the divorce and another brief marriage that ended in divorce—he moved in with his mother Nautilla in a big house in Northwest Portland where he lived for more than a dozen years—referred to as a “capitalist” in business directories—until his death at age 46 in December 1936. What remains more than 100 years later is a paper trail of news stories, advertisements and court cases that combine to tell the story of an ambitious but flawed and failed business venture. In an interesting post script, Jeffery’s California mentor Charles Elder was convicted of fraud and sentenced to 13 months in the federal McNeil Island Penitentiary. 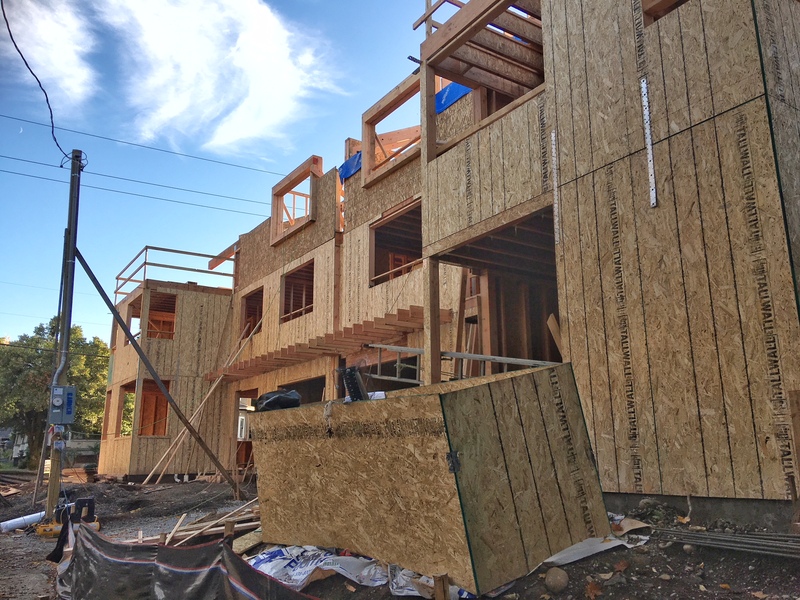 Out on the ground in Portland’s neighborhoods where life goes on, the houses built by Oregon Home Builders—embodying the work of nameless crafts people—have continued to speak for themselves by being lived in and loved by their Portland families. This list has been gleaned from a careful review of newspapers between 1912-1921 and from a study of building permits in the Alameda Park plat. In most cases, OHB classified ads did not provide specific addresses or even general vicinities. Any specific address listed here has been verified as an OHB-built home. We’re certain there are a number of OHB homes not on this list and we’ll do our best to keep it up to date as we find more. Our best guess is that during the arc of OHB’s existence, they may have built between 125 and 150 total homes. *In 1914, the company reported it had built 52 houses. Looking south on Northeast 33rd at Broadway about 1956 during construction of a new viaduct over the Banfield Freeway. The former Oliver K. Jeffery aircraft factory is on the left. Courtesy of City of Portland Archives. When it comes to time travel here in the neighborhood, one of our favorite old timers is the former Gordon’s Fireplace building on the southeast corner of NE 33rd and Broadway. We take it as a small history victory that recent marketing for the building includes the context that it was once for a very brief interlude an aircraft factory, which we brought to light in this post from November 2012, which includes photos from inside the upper floors and is filled with background on the building. What’s happening with that building today is not new news, but in case you haven’t seen, here’s a link to plans from developer Interurban, which is planning an $11 million overhaul to create three floors of creative offices and retail space, plus a penthouse and outdoor decks, with completion planned for summer 2019. 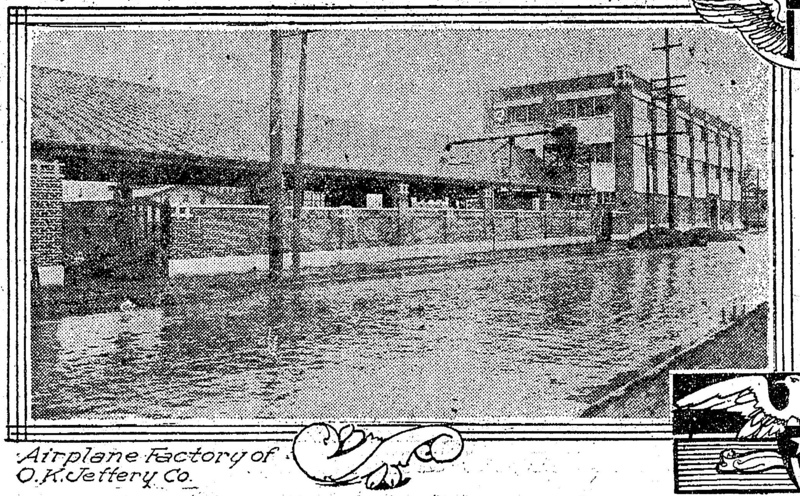 And here’s some very old news we’ve come across: the 1916 newspaper story about factory construction, which took what had been a shed built by the Oregon Home Builders and upgraded it into a full manufacturing hub for the built-in cabinets, shelves, window and door casements and furniture that went into the company’s homes. From Oregon Journal, December 29, 1916. Since our post a few years back, we’ve come across a couple of other tidbits: check out these two great photos and story from the January 1, 1918 edition of The Oregonian about Oregon spruce in the war effort. Take what it says about the building with a grain of salt. From The Oregonian, January 1, 1918. The table on Portland firefighters was a bonus thrown in by early editors jamming the New Years’ edition full of interesting facts. A similar story appeared in aviation and lumber related publications about this time, likely part of a PR campaign carried out by O.K. Jeffery. From Oregon Journal, January 20, 1918. We’ve been thinking about this building lately because we’ve been exploring the company that built it—Oregon Home Builders—and company president Oliver K. Jeffery. We had the occasion on a recent evening to visit with neighbors and friends in the Alameda neighborhood home O.K. Jeffery built for himself and his wife Margaret in 1915. It’s a beauty—one of Alameda’s five national register homes—perhaps Portland’s largest Dutch colonial revival building, built as a show house for Oregon Home Builders. The house fell on hard times in the 1970s when it served as a halfway house for wayward boys and then sat vacant for seven years. But today, thanks to the last two history-conscious owners, it’s been restored to the look and feel of the O.K. Jeffery years. From the Oregon Journal, June 6, 1915. At the moment, we’re working on a profile of the Oregon Home Builders that we’ll share here soon. 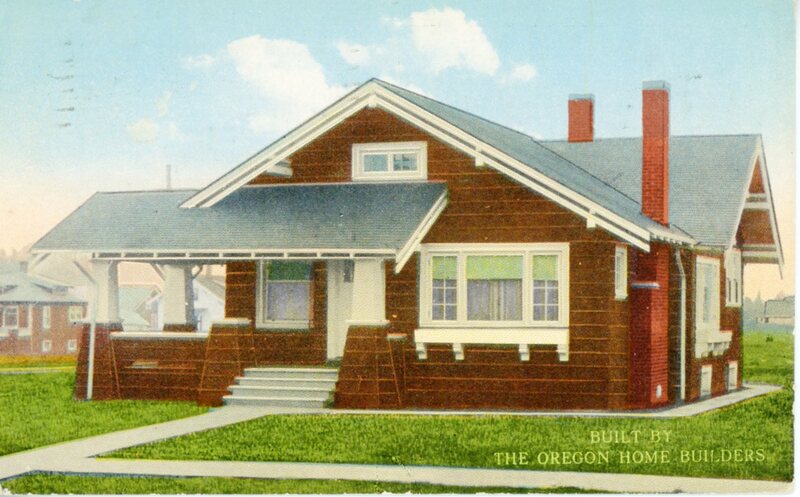 OHB was prolific between 1912-1917, designing and constructing hundreds of homes and commercial buildings and even speculating in Willamette Valley farming property before going bankrupt when Portland’s economy went south in the late teens. It’s a fascinating story mirrored by the unusual story of Mr. Jeffery himself, the son of an old Portland family, reportedly founder of the Rose Festival parade, real estate speculator, lifelong MAC Club member, auto enthusiast, pilot and visionary aviation entrepreneur. Oh, and he was a corporal in the tank corps during World War 1 too, though he never saw active duty. 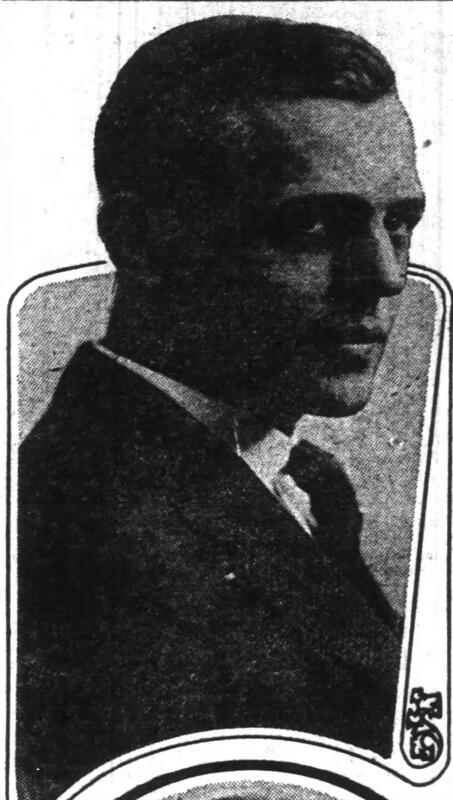 Oliver K. Jeffery, April 30, 1916 from the Oregon Journal. 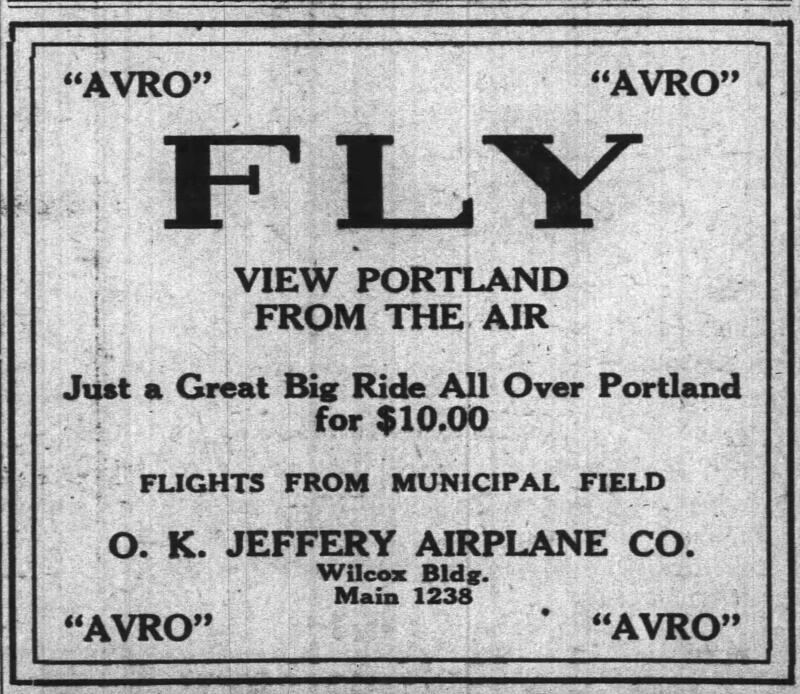 Somehow, after bankrupting the company and leaving stockholders in the lurch in 1917, and then closing down his airplane factory after its very brief life, Jeffery was able to stay active and visible in Portland’s business and social scene, attracting heavyweight local investors to his aviation ideas. In 1920 he launched the Oregon, Washington, Idaho Airplane Company with an eye to establishing regional scheduled passenger flights, long before aircraft could actually carry many passengers. The business didn’t take hold, and Jeffery survived that ending too and went on to become a local distributor for airplanes built by Curtis and Avro. And a pilot. We guess he may have been happiest just flying people around. Here’s an ad for his business. Just a great big ride. Maybe that’s who he was in a nutshell. From the Oregon Journal, June 20, 1920. Jeffery eventually found his way back to the mortgage business in 1926 when he opened First Bond and Mortgage, which vanished from the public record after the Depression. By then—after the divorce—he had moved in with his mother in a big house in Northwest Portland where he lived quietly until his death at age 46 in December 1936. Makes you want to know more, doesn’t it? Stay tuned. Born in California in November 1887, Charles W. Ertz came to Portland as a teenager and acquired his architectural education mostly as an apprentice working for two of Portland’s leading architects, Joseph Jacobberger and Emil Schacht, both of whom designed homes in northeast Portland neighborhoods. Jacobberger designed the original Madeleine Parish school and church, and interestingly, years later, his son Francis designed the brick main sanctuary at Madeleine. 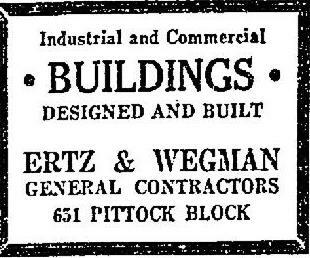 Ertz began his own practice with partner Lewis M. Dole in 1911 and later partnered with builder Edward C. Wegman as Ertz and Wegman for several years when the economy picked up following World War 1. From The Oregonian, November 26, 1922. By the early 1920s, Ertz was back on his own until 1935 when he partnered with his employee Tom Burns to become Ertz, Burns and Company. 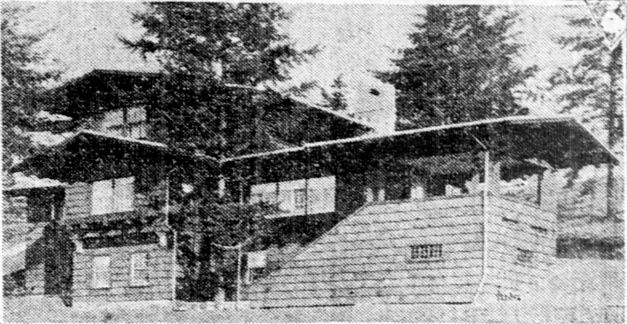 He moved from Portland to Lake Oswego, where he designed and oversaw construction of several local landmarks there including the George Rogers Building at the corner of State Street and A Avenue (1925); the Jantzen House, on the island in Oswego Lake (1936); and his own beautiful Tudor revival home at 1650 North Shore Road (1928). As his practice grew in the late 1920s and into the 1930s, Ertz kept Portland business ties but relocated to Beverly Hills in 1938 where he continued his practice until the 1970s. He died in Beverly Hills in 1979 at age 91. The Eighth Church of Christian Scientist at 3505 NE Imperial. 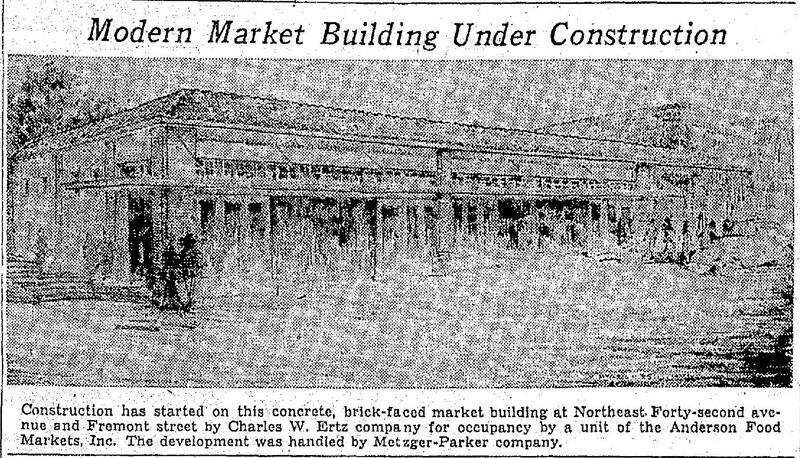 Back to the Beaumont corner of NE 42nd and Fremont: One of Ertz’s challenges with that 1935 project was to blend the design for his new market building into the existing context of the neighboring building. The multi-peaked tile-roofed commercial building just west of Beaumont Market was built in 1928. Most people visiting the corner today wouldn’t guess that they are actually two separate buildings, built seven years apart. That’s thanks to Charles W. Ertz who blended new with the old. Neither of those buildings were in place in the 1927 Beaumont photographs we’ve recently shared here. 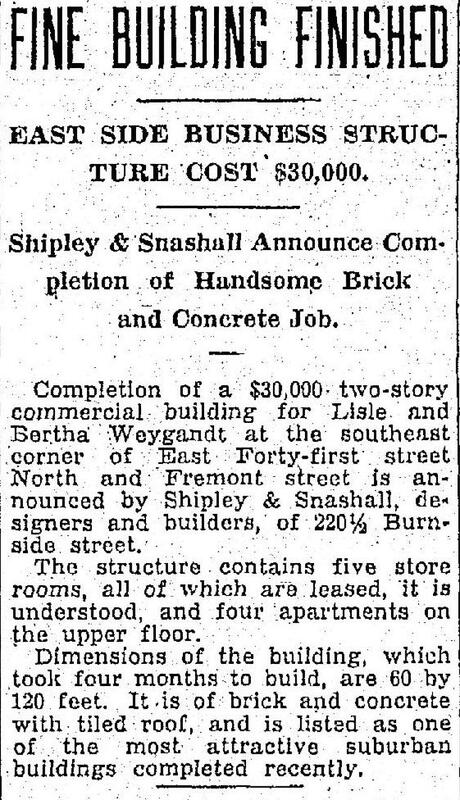 An interesting note: that distinctive original building (the one that houses Gazelle and the other storefronts today) was designed and built by Shipley & Snashall, who built quite a few commercial corners on the eastside, including the building that today houses Peet’s Coffee at NE 15th and Broadway. Next time you pass by, have a look for the family resemblance. On a recent walk, we encountered some buried Northeast Portland history that demanded investigation and made us think of a scene from an old movie. Do you remember that last shot at the end of the original 1968 Planet of the Apes when a distraught, time-traveling Charlton Heston collapses to the beach as the camera pans back and in the distance we see the top of the Statue of Liberty, half-buried, sticking up through the sand revealing the beachy landscape he was riding across was actually the middle of New York Harbor? Kind of like that, but not really. We did not fall to the ground. Clues to what once was. Curb corners mid-block on NE 24th Avenue where Crane Street used to pass through. Today, the former street is occupied by houses, garages and driveways like the one shown here. Looking north on the west side of the street. Cast into the this corner curb now marooned mid-block is a barely visible “CRANE ST.” Today, the nearest part of Crane Street is three blocks west. Today, Crane Street makes a short run from NE 19th to NE 21st, but it used to go all the way through to 24th. It’s always been a narrow street, a bit wider than an alley, but not much. 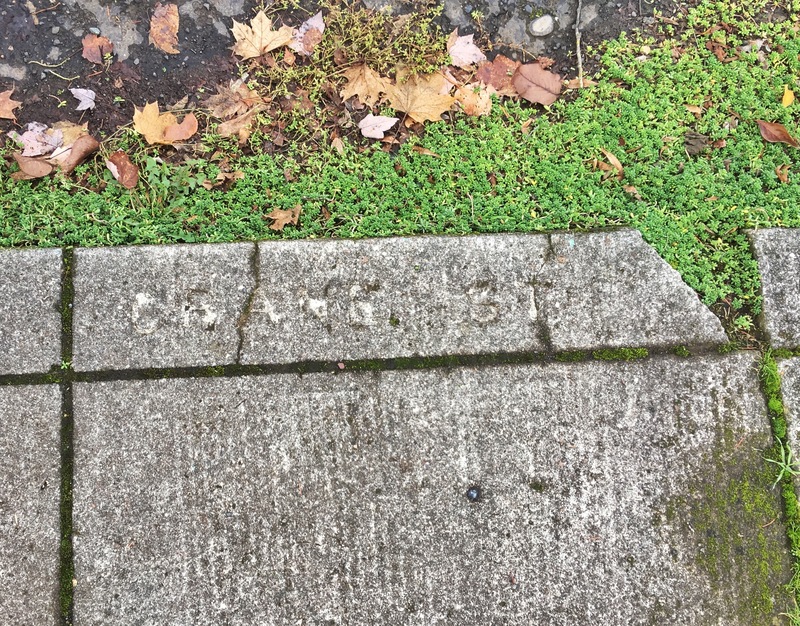 Go check it out, and then walk NE 22nd, 23rd and 24th and look hard along the alignment of where Crane used to go, you can see clues to its past: fully formed curb corners that are now driveways. CRANE ST. stamped into the abandoned curb at mid-block. Even the crown of now-gone Crane Street—the gentle sloping away from centerline—can be seen on NE 24th where Crane used to intersect. When we found those clues, we had to know more, so we visited our favorite source of official documents: City of Portland Archives. 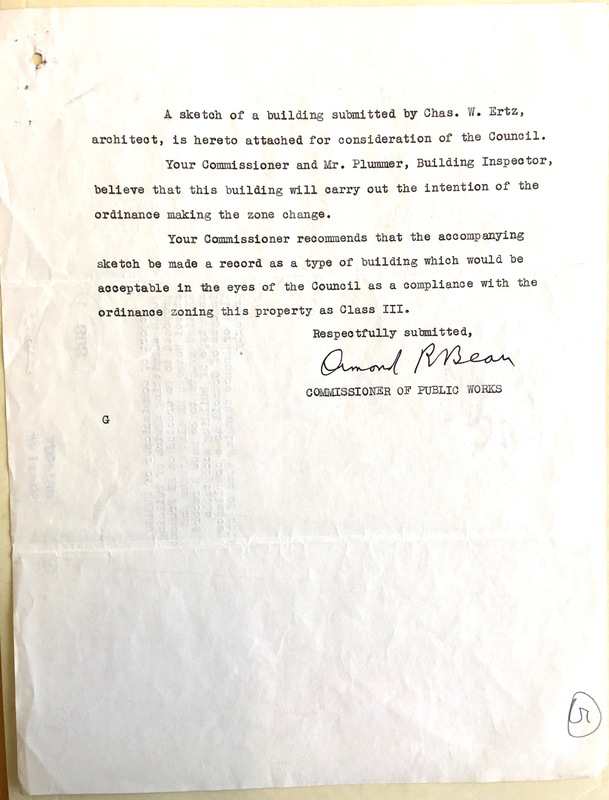 From official records—ordinances about renaming and street abandonment (a process called “vacation”), and petitions from neighbors—we were able to piece together an understanding of Crane Street. It’s probably also worth noting the topography here: this is the edge of Alameda Ridge where other streets have a hard time getting off the hill: NE 21st zigs and zags and feels like an alley as it tries to find the crest of the ridge before becoming a real street and heading downhill to the south. Mason doesn’t even bother going through: it turns into a footpath through the former orchard on the slope of the ridge. And NE 19th is impassable: it gets stuck in a cul-de-sac where it gives up and becomes a flight of stairs. This detail of the Vernon plat shows it all. Crane Street (once named Mason) appears at the bottom of the map, with detailed notations of a name change and two “vacations” or street closures and abandonments. Click to enlarge. Yes, this is part of the Vernon plat, though the city thinks of this area as Alameda. Read more about the difference between plat names and neighborhood names. The Hillside plat of 1894 locked a single slice of Mason Street onto the map that other developers tried to line up with in the following years. In 1903 when the Vernon subdivision was carved from the surrounding forests and fields, Crane Street first appeared as Mason Street, trying hard to line up with the short stretch of existing Mason Street in Hillside and the Mason Street further west in an existing plat called Irvington Heights. Because the new Mason and the old Mason were so far out of alignment, local residents at this very south edge of Vernon petitioned the city in 1909 to just change the name of the street (which was still gravel) from Mason to Crane in an attempt to reduce confusion. When Alameda Park came along a few months later, the newly re-christened Mason became the chosen alignment for the Mason Street we know today. Eugene Snyder, Portland’s leading authority on street naming, suggests the Crane namesake may have been either George Crane, an agent for Equitable Life Assurance Co., or Samuel Crane, agent for New York Life Insurance Co. We couldn’t find any logical connection to the area for these two Cranes, or any other Crane for that matter. In 1921, a majority of property owners along East Crane asked City Council to vacate the stretch of Crane between NE 22nd and NE 24th. Along with the citizen voices was a strong letter of recommendation from Commissioner of Public Works A.L. 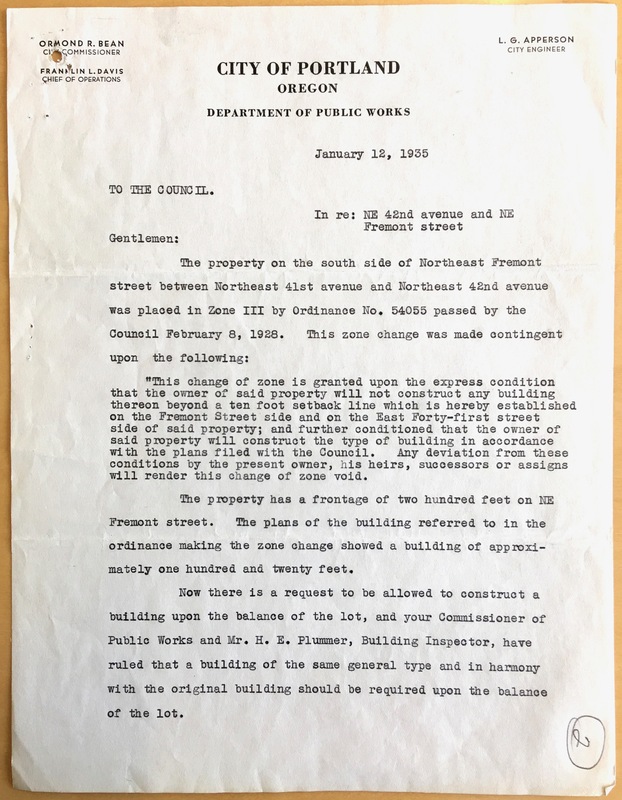 Barbur, explaining: “this portion of Crane street is slightly less than 28 feet in width and does not in any manner form a ‘through’ street which can be rendered useful for general traffic.” Council unanimously approved the request on August 31, 1921. 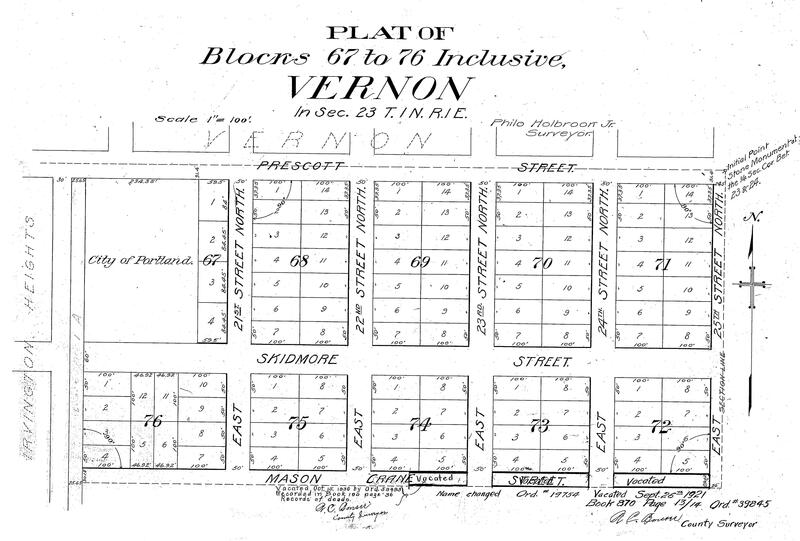 Soon after, the property formerly known as Crane Street between 22nd and 24th was purchased from the city, added to the Vernon plat as new lots, and homes were built. The left-over stretch of Crane between 19th and 22nd was still gravel. 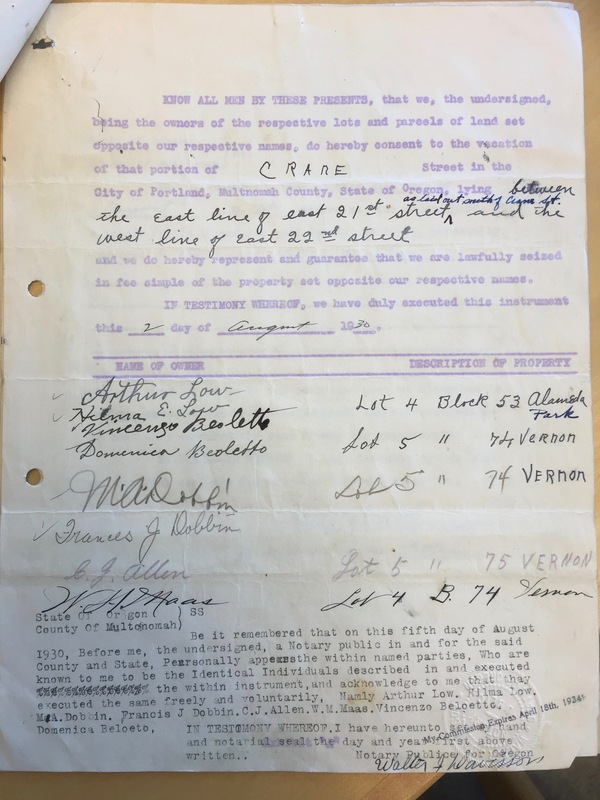 A page from the petition signed by neighbors in 1930 to vacate East Crane Street between 21st and 22nd. Courtesy City of Portland Archives. Council unanimously approved the request on October 15, 1930, and that property was purchased, replatted and built. Today, five houses sit at least partially in the middle of those two vacated stretches of the former East Crane Street between 21st and 24th, made possible by the involvement of neighbors trying hard over 20 years to enforce order on a jumbled and frankly bumbled set of plats symptomatic of Portland’s chaotic early planning history (read about the weird Prescott Jog near NE 33rd). P.S. It looks the neighbors have indeed wondered about this mystery and given the street stub its own appropriate name: check out the Ghost of Crane Street. In the spirit of knowing that pretty much everything is connected, we were intrigued to learn of the ties between mid-century modern builder Kenny Birkemeier (1905-1996) and the old Vernon School block south of Alberta between NE 22nd and NE 23rd. Frequent AH readers will recall the story of Old Vernon (which is one of our favorites), the giant wood frame structure that once occupied much of the block bounded by Wygant, Going, NE 22nd and NE 23rd. It’s a fascinating story of Portland’s early school building challenges, the growth of a neighborhood and the all-too-frequent fate of Portland’s early all-wood institutions. And there’s virtually no trace left even though its impact on the neighborhood during its heyday cannot be overstated. Learning about Old Vernon was a bit like a curtain going up to reveal an entirely different neighborhood that once was. Readers will also recall that Ken Birkemeier was one of Portland’s most prolific and resourceful builders between the mid-1930s and the 1950s. Dozens of his homes, most with a distinct family resemblance of Roman brick, ornamented brick facades and whimsically placed oval windows, can be found in nearby northeast Portland neighborhoods. So–you’re wondering–how do these stories connect? In the aftermath of the big fire, the school district contracted with Rose City Wrecking in March 1933 to haul off the burned remains and to demolish and remove anything else still standing on Block 54, which they did. An aerial photo from 1936 shows the footprint of the burned building and lots of open land. 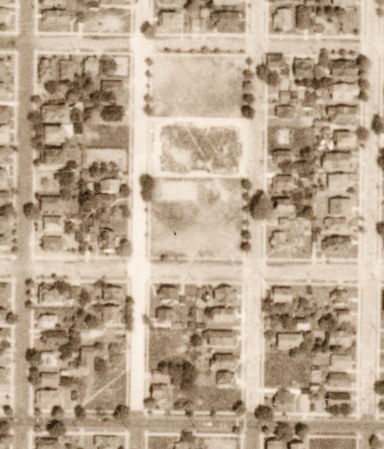 Detail of an aerial photo from 1936 showing vacant Block 54 and the burn scar / footprint of old Vernon School. NE Prescott runs east-west along the bottom of the frame. The mid-1930s were not a great time for homebuilding in Portland, so Block 54 sat vacant for a few years. The Great Depression killed the real estate market and tightened down on much of the available money to build or to buy. But gradually the market returned and our resourceful Mr. Birkemeier acquired the entirety of Block 54: all 18 lots. 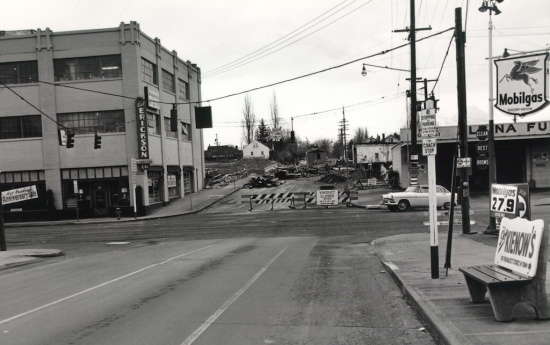 Our review of city permits, prompted by eagle-eyed AH reader Michael Johnson, shows Birkemeier began building in October 1940 on the south end of Block 54 (2225 NE Going and 4621 NE 23rd, to be exact) and worked his way north. He finished the last of the 18 houses on that block in the winter of 1944 with a pair of duplexes at 2210 and 2232 NE Wygant. Ken Birkemeier was a talented builder, and an effective marketer as well. Many of his homes from that era were featured in The Oregonian, including photos of the houses and occasionally of him too. But a careful review of past issues from those construction years didn’t turn up anything from Block 54. So here’s an opportunity for you to go walk along the invisible fault lines of the past, from the long-ago schoolyard, to the brand new block of the 1940s, to the changing neighborhood of today. Make no mistake, change is our constant companion. That’s how it always has been and how it should be. How we change will explain a lot to the future about what we value today. 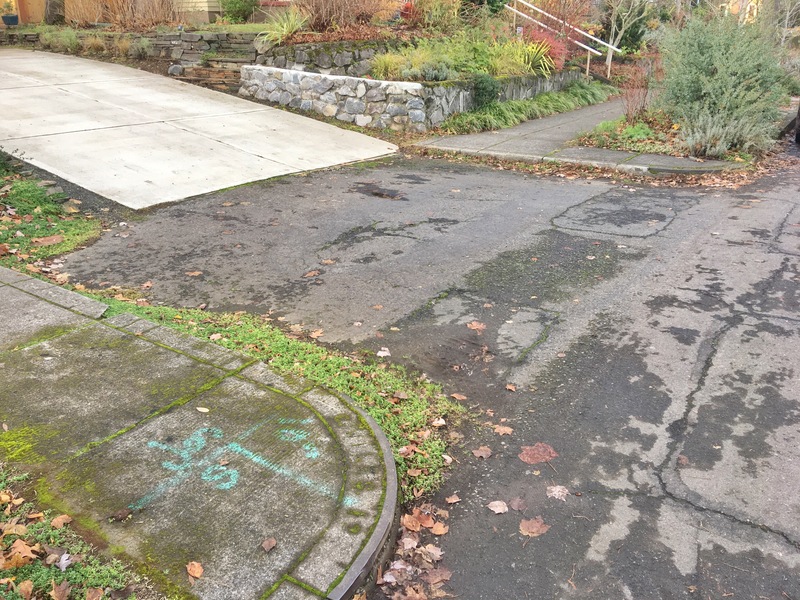 If you live on a block that has a small house on a corner lot, or maybe a home that has experienced some long-deferred maintenance or structural compromise, chances are you’ve been wondering or worrying about the current spate of tear-downs underway in northeast Portland. The northwest corner of NE 30th Avenue and Skidmore, October 2017. Site of the former Kettleberg home, built in 1921. These days in our neighborhood, homeowners are looking up and down the street and wondering which house will be torn down next, or if the eventual buyer of their own home will tear it all down and build new. No one wants to wish this on their neighbors or lose the family memories and history of their own home. In the last two months I’ve been contacted by worried neighbors, AH readers and others who share a sensitivity to and appreciation of older homes. People ask what can be done, could I help them research the house, am I interested in buying or helping them with their fixer-upper? Remember when fixer-uppers were even a thing? A bargain, a project, something possible? Today, fixer-uppers tend to get torn down. There are some notable exceptions, like this courageous project we’ve been watching closely in the Concordia neighborhood. The reality is, there’s not much neighbors can do to fend off a tear-down next door or down the block. 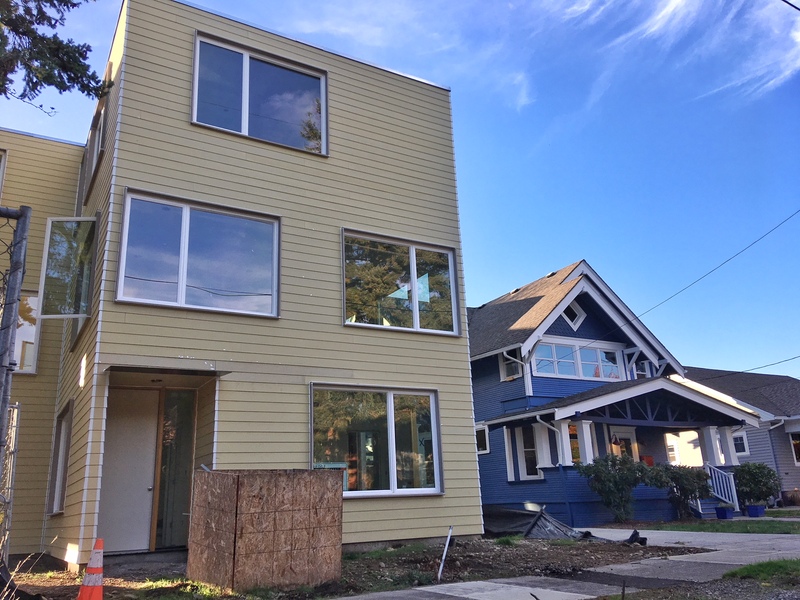 The city’s recent policy discussion about the tear-down trend—contained in the Residential Infill Project (RIP)—identifies the concern and offers some movement on the scale and size of new construction after tear downs, but doesn’t offer neighbors much in the way of influencing specific tear-downs. New construction built in the footprint of residential tear-downs or lot conversions has been shockingly insensitive and out of scale to its neighbors. Just look at this charm-free apartment-block-like building now almost completed in the middle of a residential Beaumont neighborhood. Would you like to live next to that? We’re not anti-development, and we celebrate Oregon’s land use planning framework that protects primary natural resource lands by focusing growth within urban growth boundaries. But before it’s too late, we must help city leaders understand the new fear lurking in old neighborhoods and how the tear-down trend is reshaping the corners and the feel of our residential streets. Frankly, we’d rather write about our ongoing research and the fascinating history of our local buildings and neighborhoods. But the tear-down trend is too pressing and impactful to not bring it to the top here from time to time. We recommend the Portland Chronicle, a website devoted to publishing the most recent list of city-approved demolition permits. It’s a website I’ve shared multiple times with anxious readers and neighbors wondering if their block might be next; a radar screen of sorts that surfaces and then tracks the sad parade of doomed homes and lots, many of which are in Portland’s older eastside neighborhoods. One interesting and innovative solution we’ve learned about comes from natural resource conservation circles, called a “conservation easement” that restricts future demolition for certain qualifying properties. Though not in widespread use—and not for every property—it can be a tool for homeowners to protect their properties. Another creative and admirable approach has been neighbors coming together to purchase and refurbish “fixer uppers” that might otherwise be headed for a tear down. We’re looking for examples. Wiling to share your story of neighborhood anxiety and wonder, or creative solution? A brief pause from the Beaumont photos here on AH to make a deep dive into back copies of The Oregonian and other research into several stories we’re working on, and to learn more about the early Beaumont business district. Interesting stuff, so stay tuned. It’s always easy for us to lose ourselves in the serendipity of research, especially during the quiet days at the end of the year. 926 East 39th Street North is today’s 4404 NE Cesar E. Chavez Boulevard, in northeast Portland’s Wilshire neighborhood. Margaret Gray Montgomery took out several other classified advertisements during this period, including one that advertised her office being located at 910 East 40th Street North (4324 NE 40th). A site office in addition to the Porter Building address? Curiously, Margaret Gray Montgomery didn’t appear in city directories as a builder or otherwise connected to the real estate business, wasn’t listed as owner of this or the 40th Street property in construction or city records, and was invisible to the federal census of 1930 and 1940. For what it’s worth, the 11th floor of the Porter building (see bottom of ad) was a hot spot for real estate and mortgage companies in the late 1920s. Crawford Range for sale, also dining room rug and Hoover; will sacrifice, leaving city tomorrow evening. Also equity in beautiful home, 926 E. 39th N.
Ken Birkemeier, the prolific Alameda neighborhood designer and homebuilder, always remembered the first house he ever built: a cute little English storybook style home at 829 NE 41st. 829 NE 41st Avenue. Ken Birkemeier’s first homebuilding project. Photograph is from a 1932 story in The Oregonian about the sale of unused public property. 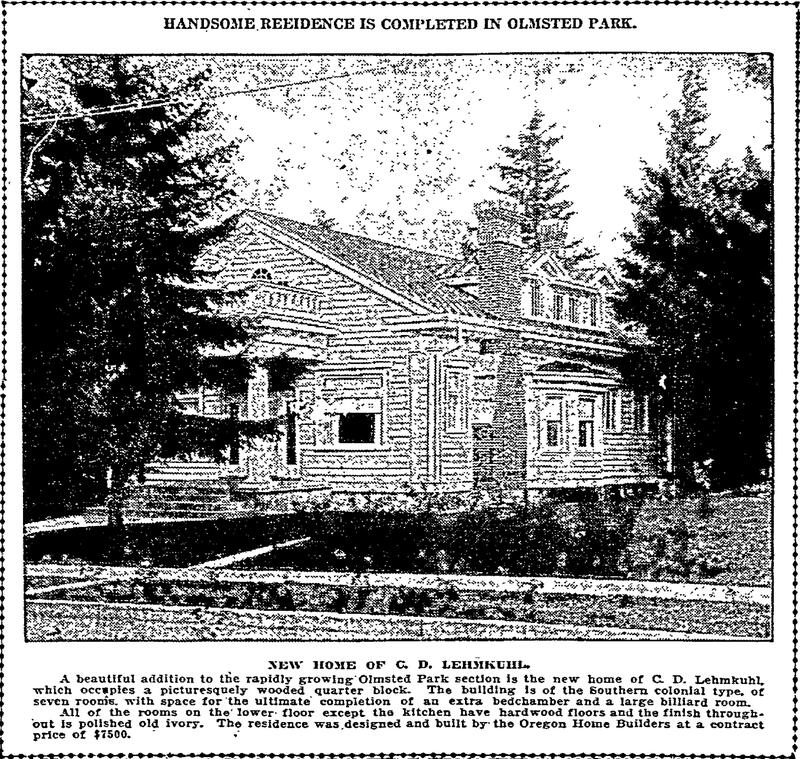 The lot, located on a small peninsula just across the street from Laurelhurst School, had been kept in reserve in case the city needed it for school purposes, but was eventually purchased and developed by Birkemeier. Birkemeier, whose work has come to signify the best of the Mid-Century Modern movement in Portland, built more than two dozen homes here in Alameda alone, often on steep or challenging lots. According to homeowner and AH reader Gary Groce, Birkemeier dropped by one day during his later life, sometime in the late 1980s or early 1990s, like a salmon returning back to where it all began. Groce wrote us recently with this account of his impromptu visit with the Mid-century Master. As I recall, I was outside the house working on something when this largish car pulled up with an older couple inside. They were looking at the house. I walked over to the car and he introduced himself. My impression was that he had recently married this charming woman and wanted to show her the first house that he built. We invited them in and showed them things we had done to restore the house as close to original as possible including the re-acquisition of original art-deco slipper shade lights, etc. I lamented to him that the original fireplace façade in the living room had been changed at least twice and that someday, I hoped to restore it to original. He very graciously invited me to his home in the west hills as he thought he might have blue prints, and sketches of the fireplace. I took him up on his offer. I remember his home being this unbelievable, sprawling mid century modern with a fantastic view. In retrospect, that home was undoubtedly of his own design and build. Unfortunately, he couldn’t seem to find anything of interest on our house so we just spent our time visiting. I came away with the impression that this was a very successful, intelligent man who never lost the common touch. Very warm and personable. In the years following the passing of his wife of 50 years (Marge), Birkemeier married Ramona, who he evidently wanted to see where all the homebuilding work began. Birkemeier died in 1996. The last house he built in Alameda is at 2830 NE Regents Drive (1952). To read more about Birkemeier’s life and work, check out the profile here on the blog. With thanks to Gary for sharing this memory. 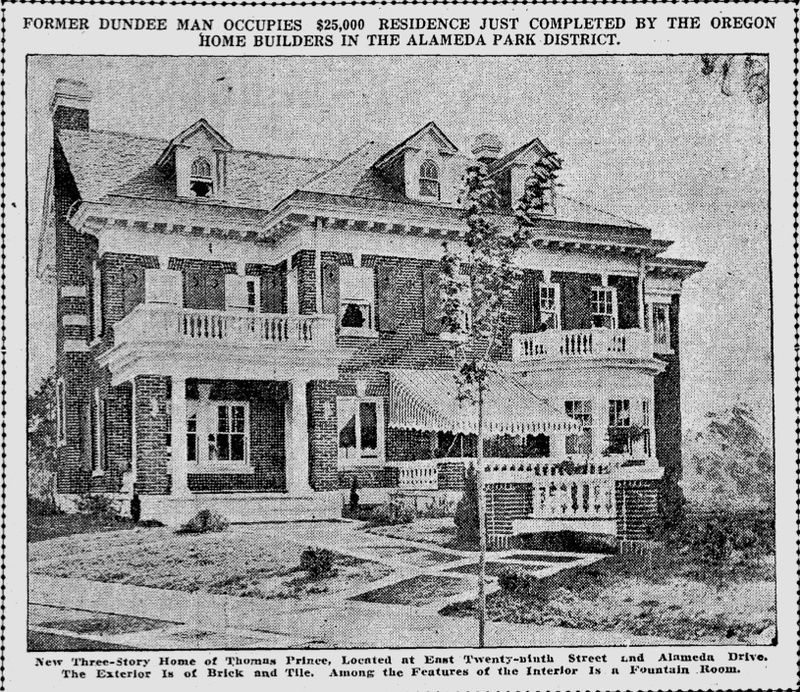 Here’s the home of Portland architect George Asa Eastman, photographed 100 years ago to illustrate a story in the May 5, 1914 edition of The Oregonian about how the Alameda Park neighborhood was “forging ahead.” The subtitle to the headline was “Few districts enjoy more substantial growth than suburban park. New homes are sprinkled over many handsome streets.” Eastman designed this home and supervised its construction in 1912. While the story didn’t recognize Eastman’s contribution to local construction trends, he was a principal architect for the Oregon Home Builders, which built more homes in Alameda Park and Olmsted Park than any other builder. You’ll recognize this house today at 2628 NE Stuart Drive, where some recent major changes in landscaping have enabled a full appreciation of the Craftsman style home and the unique site on the sidehill of Alameda Ridge. For a short time after construction, NE Stuart Drive was known as Rugby Drive, a name that is still visible if you know where to look. An accident on the property in 1917 gave rise to the name–still in local usage–of Deadman’s Hill. A careful look at then-and-now will reveal that the top floor open porch of the house has been enclosed; many windows have been replaced and a couple have been added; a new deck and walkway have been added along the lower level; trees have come and gone (but appear in similar locations); a power pole has been added in the foreground. Eastman was active in Portland from about 1909 until he moved to Detroit in 1916. He died in 1920. 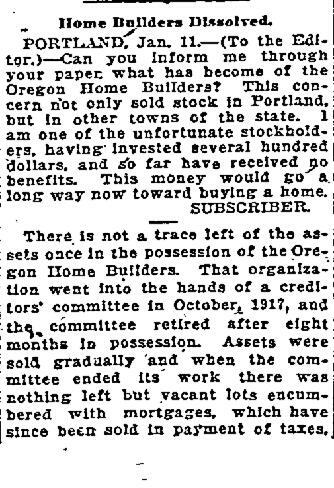 Stay tuned for more on Eastman and the Oregon Home Builders: both are the subject of current inquiry and research.